The City of Spirit Lake understands the importance of the business community to our quality of life and economic future. The City partners with the Lakes Corridor Development Corporation for growing and maintaining our large business ventures. The Corridor connects us to State programs for business development and retention. In addition, the City Council has adopted a tax abatement program for new construction of commercial property. In addition, five-year tax abatement is available for the construction of a speculative shell building. For downtown properties, the City Council has enacted the Olde Town Design Improvement grant program. This provides a 40% grant of up to $20,000 for improvements to the façade of downtown business properties. For more information, contact the Spirit Lake Chamber of Commerce, 712-336-4978. The Spirit Lake Development Corporation is a non-profit community corporation that serves the City and surrounding area in the development of industrial and commercial ventures and to promote the general economic well-being of our community. 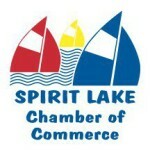 The Spirit Lake Chamber of Commerce supports local business and the community. The Chamber is a part of the Iowa Great Lakes Chamber of Commerce. These Chamber organizations provide support to and promotion of area businesses. A variety of business regulations have been enacted to promote the attractiveness of the City and public safety as well as establish certain community standards. If you are considering opening a new business in Spirit Lake or making certain changes to your business, please be aware of these regulations. See the list below for regulations that might affect your business. To find these references, please see City Code and Zoning Code.